The cheapest way to start a summer garden is to simply turn up some soil in your backyard and toss in a couple seeds and see what pops up. While this saves a bundle on gardening start-up costs it can lead to some pretty erratic results. It’s generally best to control for some of these variables by building a raised garden bed and hauling in fertile soil that has been amended for gardening. While there is much debate among lifestyle gardeners about the best and most cost effective materials to build a bed out of, it’s hard to argue against free (though some seriously dogmatic gardeners would). Salvaged wood rescued from allies and abandoned lots can be hewn together and filled with dirt for next to nothing. If you don’t have your own pile of waste wood to weed through you can hit up Habitat for Humanity’s ReStore for salvage lumber at a super low cost. If you are wondering which seeds are best suited for your newly raised bed, you can call the Master Gardeners who work the phones through the county’s UC Cooperative Extension. 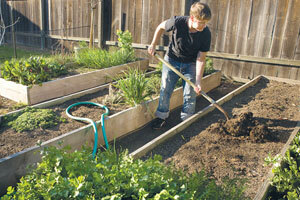 Trained volunteer Master Gardeners offer advice about local gardening over the phone Monday-Friday. And it’s free! Raised beds aren’t your only option for creating great growing conditions, especially early in the season. 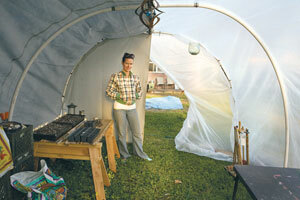 Hoop houses or homemade green houses are a great DIY way to get your garden started. These simple structures crafted out of PVC piping and plastic sheeting require a little more work than a 4X4 bed, but they offer your seedlings a higher temperature to spur germination. Plus you can impress all of your friends with the ingenuity it took to see this project through. Specifications for successful hoop houses can be found all over the internet. Sacred City Derby Girl and eco-conscious Sacramenten, Stacie Traylor, modified her Burning Man structure to create a climate controlled environment for sprouting her seeds. She based her back yard construction on plans found at http://www.chromatest.net/Lovemonkey/. You can find the PVC pipe for your project at the only hardware store on the grid, Capitol Ace. Or you can hit up the neighborhood stalwart East Sacramento Hardware who stock the precut lengths you’ll need for your greenhouse. Traylor recommends springing for a grommet maker to help secure the plastic sheeting. She offset the cost of the grommet maker by using plastic zip ties to secure the sheets to the piping. If plastic sheeting and salvaged wood isn’t quite the aesthetic you are looking for, you can invest a little more cash and pick up some redwood at Hollywood Hardware on Freeport Blvd. Hollywood Hardware has the lumber, the L brackets, the soil, and the screws you’ll need to build a bed that will stand the test of time. A simple 4X4 construction won’t set you back too far, plus you’ll be supporting a Sacramento institution that’s been doing business since 1948. If you are on a budget but lack the savvy it takes to build your own bed, it is time to call on experience. Garden enthusiast and garden box builder Rick Jaques started an unusual marketing campaign last year. He started dropping mock-ups of raised beds into abandoned planter boxes around the central city. Jaques hopes to grow his passion for gardening and construction in to a viable side business. You can check out his work at www.ovtomato.com. A small bed starts at $100 and moves up from there. Talini’s on Folsom Blvd has been operating as a family owned business since 1976. They’ve built a loyal following by stocking unusual plants and offering a dynamic selection of organic gardening supplies. Talini’s has an eye for cool”and you can incorporate some of their style in your back yard through their residential services. Jadin Darshan is Talini’s residential garden designer and he’ll consult for $75/hr and work with you on everything from irrigation to raised beds and lighting for $40/hr. Capital Nursery is another gardener’s paradise that will do the work for you. 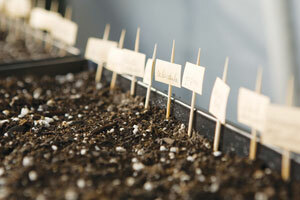 Their website promises that no project is too small and their incredible selection of mature plants is aimed to please. Once your bed is installed and your babies are blooming you might want to spruce the place up with decorative elements from The Gifted Gardener. This J street shop stocks its shelves with pricey little afterthoughts. Here you can find ornate bird feeders and fancy stepping stones. The Gifted Gardener isn’t for your garden; it’s for you the gardener. Enjoy!